I'm having some issues with the dealer kit installed on my Ranger. I am the 3rd owner and the kit was installed at the dealer that the 2nd owner purchased the truck from here in Phoenix, AZ. It has ran great since I bought the truck two years ago other than some rare short cycling last summer at temps over 105F. Something I was planning on taking a look at this summer but instead it suffered a fairly catastrophic failure back in June. The aluminum bracket broke at the bottom rear bolt into the engine block and snapped all other mounting bolts into the block. I now have the system reassembled. The aluminum fitting on that top hose is now cracked. (Most likely happened when the bracket broke) It's the compressor/condenser hose. Can I braze the crack or should I replace just the fitting or the whole damn compressor/condenser line? Once repaired will I need to evacuate the system in order replenish the R134? I have an R12 accumulator/drier, how important is it to change it since the previous owner converted to R134? 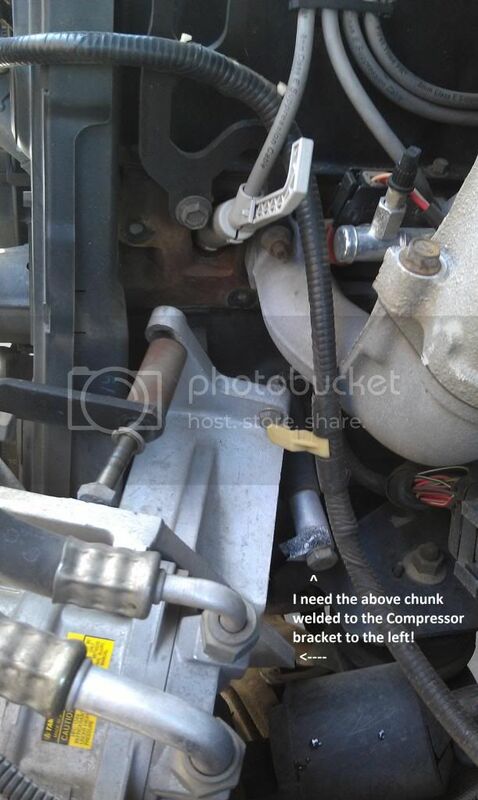 Currently the compressor clutch does not receive power. Following the power line from the condenser to the compressor there is power going into the first switch but not coming out. If I bypass the first switch the second switch is in the same situation, bypass both switches and the compressor kicks on. (I didn't let it run for more than about a second due to fear of damaging something). Again, thank you for any and all assistance. I'm hoping I can learn what is needed and save some much needed $$ getting this repaired myself. Since they make AC kits, they "May" have a new bracket cheaper than welding the old one.. If the line is cracked, get a new one.. Arizona mobile air can help you with that also.. A call to your local ford dealer might give you the system capacity they used.. It could differ from Factory installed air, but 22 ounce is a good starting point if you can't find out..
Change the accumulator.. Should have been for both refrigerants in 97 anyway, but it's good to change it anyway..
Change the O tube, check for debris, you mentioned catastrophic failure, so flushing the system might be needed if you didn't do that already?? There are the compressor mount kits we have available. I sent a quote request to that email address before finding this forum so I should be hearing back soon. The catastrophic failure was the bracket cutting loose and taking out my timing cover and doing enough damage to my timing belt to make me replace it. Other than the bracket and the cracked hose end there was no damage to the ac assembly. Yup, the bracket has been repaired but I am contemplating replacing it with new to avoid any future issues. How can I tell if my accumulator is universal for both R12 and R134? What is the cost on the 7156? What would the cost be for a replacement compressor/condenser hose? What would the cost be for refrigerant and oil? You would need to remove the fitting before brazing on it so the hose doesn't burn, at that point it makes more sense to just replace it-- it looks like a standard part. You could potentially reuse the hose rubber if you can stand it being cut off shorter, otherwise replace the rubber and re crimp both ends. Make sure your hose shop uses A/C barrier hose parts not hydraulic stuff. Any receiver you buy now will be 134a compatible, often has a blue label on it stating that. Fell free to contact our staff for a quote. I don't really post prices on the forum unless it is a link to the online store. I was thinking silver solder I've used it before on hydraulic line fittings and just wrapped the crimped part and hose in a cold wet rag. But you make a valid point so unless the entire hose is sub $40 I'll probably just cut the hose and replace the fitting. Which part is the receiver, is that another name for the accumulator? Thanks, I'm hoping work takes me near the area tomorrow so I may just stop in. I sent a request to the info email address before making my initial post here but haven't heard anything so I figured I would see if you had the info.